Adams, Robert, and Pamela Crippen Adams (eds.). 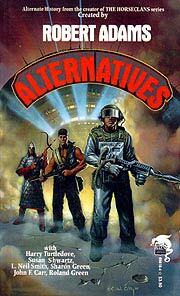 Alternatives. Baen 1989. Summary: New stories, including John F. Carr and Roland J. Green "Kalvan Kingmaker", Roland J. Green's, "The Goodwife of Orleans", Susan Shwartz's, "Count of the Saxon Shore", L. Neil Smith's "The Spirit of Exmas Sideways", and Harry Turtledove's "Islands in the Sea".